FRANKFORT, Ky. — Western Hills High School students got a dose of reality Thursday when they witnessed the tragic consequences of one moment of carelessness on an ATV. The accident was staged, but the scenario was real, and it plays out on roadways and in fields across Kentucky too many times. Commissioner Comer signed a proclamation declaring Sept. 15-21 to be Farm Safety and Health Week in Kentucky. 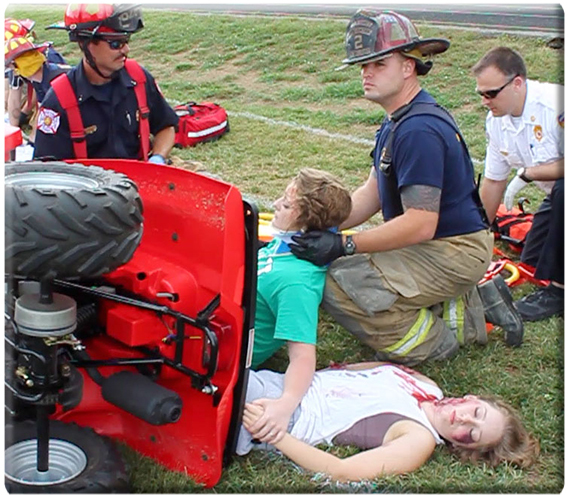 The Rally for Life featured a mock ATV accident with Western Hills students as the victims. Local emergency responders used real-world tactics and techniques to treat the students. An Air Methods medical helicopter stood by to fly victims from the scene. Kentucky reported 120 ATV-related deaths from 2008-2011, according to the Consumer Product Safety Commission. Kentucky ranked fourth in the nation behind only West Virginia, Texas, and California. Sixteen farming-related fatalities were reported in Kentucky in 2012, the Kentucky Fatality Assessment and Control Evaluation Program stated. That was down from 22 farm fatalities in 2011 and less than one-third of the 50 fatalities reported in 1995. The Kentucky Department of Agriculture’s Farm and Home Safety Program travels to every county in Kentucky to deliver safety messages to schools, farm groups, civic organizations, and other groups that request a presentation. The program operates a one-of-a-kind rollover tractor simulator, which demonstrates the correct use of a rollover protective structure (ROPS) on a tractor, and a miniature grain bin and wagon. For more information on the Farm and Home Safety Program, go to the Kentucky Department of Agriculture’s website, www.kyagr.com. Watch video from the Rally for Life here.